Math Mammoth Grade 7 International Version - description, samples, and purchase info. Math Mammoth Grade 7 International Version is a complete maths program for seventh grade. It consists of two student worktexts (A and B), a separate answer key for each, tests, mixed revisions, and in the download version, an additional worksheet maker (Internet access required) to make extra practice worksheets when needed. In the book 7-A, we start out with an introduction to basic algebra, which is in many ways a revision of the same topics from 6th grade. The first chapter revises the order of operations, the concepts of an expression and equation, and the distributive property. Students learn about the commutative and associative properties of addition and multiplication, and they simplify expressions that do not involve negative numbers. 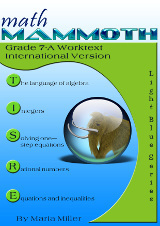 In chapter 2, we study integers and their operations in detail. Some of this is revision from 6th grade, and some of it is new. The four operations of integers are explained with the help of two visual models: the number line and counters, hopefully providing an intuitive understanding of the processes. Students need to be able to add, subtract, multiply, and divide integers when they learn to solve equations in chapter 3. In the end of the chapter students also learn about negative fractions. In the next chapter (chapter 3) students study simple one-step equations. They already know the basics of how to solve this type of equations from 6th grade, but this time we use negative numbers in them. Chapter 4 is titled Rational Numbers, which are simply fractions and certain decimals, so the student is already very familiar with them. The goal of the chapter is to be able to add, subtract, multiply, and divide both positive and negative fractions and decimals. We also solve simple equations involving fractions and decimals and learn about scientific notation. The last chapter in part 7-A focuses on linear equations. The student learns to solve various types of linear equations and practises using those in simple word problems. We study linear inequalities but not to the same depth as linear equations. Lastly, the student graphs linear equations and is introduced to the concept of slope, which is the steepness of a line. The student can continue studying these topics with more details in an Algebra 1 course. Geometry is our focus in chapter 8. Students draw geometric figures using a a protractor and a ruler, and they also learn some basic geometric constructions. The other themes of this chapter are various angle relationships, area and the perimeter of a circle, conversions between units of area and of volume, surface area, volume, and cross- sections when solids are sliced with a plane. Chapter 10 is an introduction to probability. Besides learning the basic idea behind probability as the ratio of favourable events to all possible events, students compare experimental probabilities to theoretical ones in probability simulations and even design some on their own. Please also see the table of contents for 7-A and 7-B (in the sample), which will let you see the topics covered in more detail.